Potential for an industrial hemp processing facility in the High Prairie or Falher region was presented at an information meeting April 17 in Triangle. 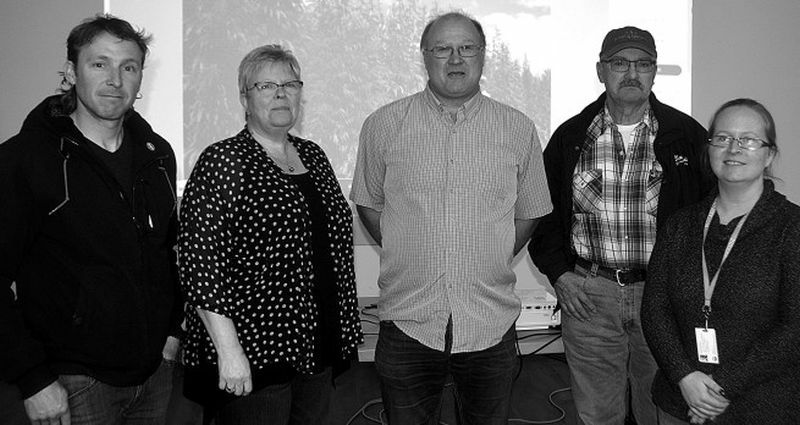 Left-right, are Falher farmer Luc Levesque, two keynote speakers Diane Chiasson of conseil de developement economique de l’alberta and Byron James of InnoTech Alberta, along with farmer Dave Dvornek of High Prairie and Big Lakes County agricultural fieldman Sheila Kaus. Potential opportunity to locate an industrial hemp processing facility in the High Prairie or Falher areas was presented at an information meeting April 17 at Triangle. Residents and farmers were updated about the Northern Alberta Hemp Processing Industry initiative project, to locate a plant in the Peace region. A new plant would enhance the flourishing industry in Alberta. “We are looking to develop the market in the north and the location will be decided by industry,” says Diane Chias- son, northwest director of Rural Development and Entrepreneurship for the conseil de developement econom- ique de l’alberta. CDEA received a $200,000 grant last year from the provincial Community and Regional Economic Support program to work with municipalities and agricultural and economic partners to attract a business to locate a plant in the Peace region. “Big Lakes and Smoky River both have potential sites identified,” Chiasson says. Northern Alberta is a prime area to produce hemp since the long daylight hours produce plants as high as 10-12 feet tall and even higher farther north, Chiasson says. “The more farmers interested in growing hemp, the better,” she says. Big Lakes, the M.D. of Smoky River and the Smoky Applied Research Demonstration Association were the key hosts for the meeting that drew about 30 people from throughout the Peace. Chaisson says the NAHPI committee including local municipal and agriculture representation has made several international con- tacts. About 12-15 interested investors will be invited to visit the region in September to tour potential communities. “They can see we have a lot of land and we can grow hemp,” says Chiasson. SARDA has already been growing hemp in test plots, she notes. The product is growing in demand to use for a variety of purposes. “Hemp is an environmental superstar. . .and has excellent durability and absorbency,” says Chiasson. Hemp is the basis of many products used for constructing buildings and automobiles. “It will be competitive in Canada and prices for producers will rise with demand,” Chiasson says. Every part of the hemp plant can be used, says Byron James, supervisor of pilot facilities for InnoTech Alberta, which operates a decortication facility in Vegreville. “Hemp has nothing to do with marijuana,” James says. A facility to produce a non-woven mat line is operated in Drayton Valley by BCG using hemp fiber. Hempco has a seed facility at Nisku with decortication of hemp straw to be added soon. The initiative committee includes Chiasson, Big Lakes County deputy CAO Jordan Panasiuk, SARDA extension co-ordinator Shelleen Gerbig and Dan Dibbelt, executive director of Peace Region Economic Development Alliance.